Why Your Audi’s Thermostat Important? Audi is a car brand that has been around for many years and has a reputation for manufacturing quality vehicles. However, the Audi brand was not always at the forefront of vehicle technology development. When Volkswagen acquired Audi in 1960, it was transformative for the company as a whole and created the image we associate with the company today. Once Volkswagen purchased Audi they began to really push for development and research in automobile technology and innovation. Even since the beginning of the company’s history, their research has been to develop higher safety standards. They were even the first company to perform crash tests on their vehicles. Even with all of the research and technology developments, Audi vehicles can still experience malfunctioning parts from time to time. An important part of engine health and performance is the thermostat, so it is important to keep an eye out for any symptoms that may indicate a thermostat malfunction. 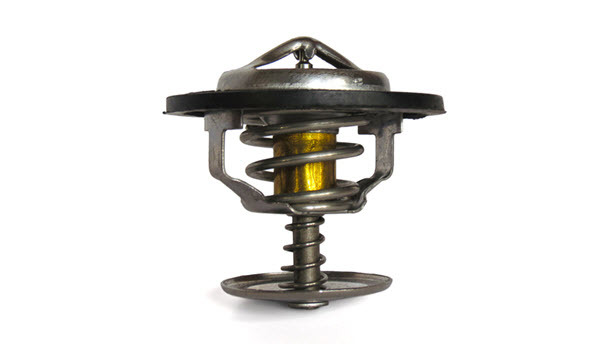 The thermostat in your vehicle is important to the proper function of the car’s engine. If the temperature of your engine is regularly inconsistent and fluctuating, your vehicle will decrease in performance and could damage your engine. It also will reduce the fuel mileage and efficiency of your car. The thermostat works to speed up the time it takes for your engine to heat up. It also works to make sure that your engine does not overheat or remain too cool. It regulates the temperature to help optimize the engine’s performance. This is especially useful when driving in very hot or very cold climates. The thermostat also helps with your fuel consumption. If not properly functioning, it can cause engine wear that will shorten the lifespan of your car. When dealing with thermostat issues, your car’s engine can either overheat or it will remain too cold. When you start your vehicle, your engine is cold because the vehicle has not been running, but the temperature should rise relatively quickly. The temperature gauge regulates the heat in your vehicle and provides coolant from the radiator. If your thermostat is unable to open, it won’t allow for your engine to cool properly, which will result in your engine overheating. 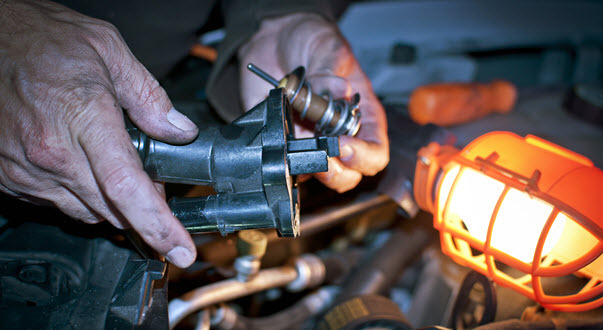 If the thermostat remains open, then you will have a constant source of coolant going to your engine. You do not want your engine too hot or too cold, so keeping an eye on your temperature gauge will help you determine if you are experiencing any thermostat problems. In newer vehicles, some models only provide a warning light if your car begins to overheat. If your warning light comes on, that means that your car is overheating and it is important to stop driving your vehicle, as permanent damage can be caused by excessive heat. The thermostat remains closed when your vehicle is off. If it is working correctly, once the engine is turned on the thermostat begins to open, providing coolant to the engine as the temperature begins to rise. While temperature issues are generally a result of a poorly functioning thermostat, they are not the only cause for temperature issues. It may be as simple as a faulty temperature gauge or you could just simply be low on coolant. In order to properly determine the cause of your temperature issues it is recommended to visit a mechanic you trust for a diagnosis. Here at A&M Auto Service we offer services to help fix temperature issues you may be experiencing with your vehicle. With years of experience, our expertly trained mechanics have knowledge and understanding of luxury vehicles and will be able to properly diagnose and make repairs to your Audi from our garage, which is convenient to Pineville, Charlotte, and Greensboro, NC. We aim to provide quality service to ensure your vehicle has a long life. In addition to servicing existing issues, we also provide maintenance and offer preventative services to make sure that your vehicle runs smoothly. If you would like to get more information about the services we offer or are interested in scheduling an appointment, please contact our office where a representative will be more than happy to assist.